Preheat Presto® Electric Griddle at 400°. Coat filets on both sides with Creole seasoning. Melt 1 tablespoon of butter on griddle and spread on area where fish will cook. Place fish on griddle and cook until browned, about 2 minutes on each side, depending on thickness of fish. On the other side of the griddle, heat tortillas until warmed, about 1 minute for each tortilla. Turn once after 30 seconds, careful not to burn them. Repeat until all tortillas are warmed. If griddle is large enough, you may cook the fish and tortillas at the same time. Remove fish from griddle and set aside until tortillas are ready. 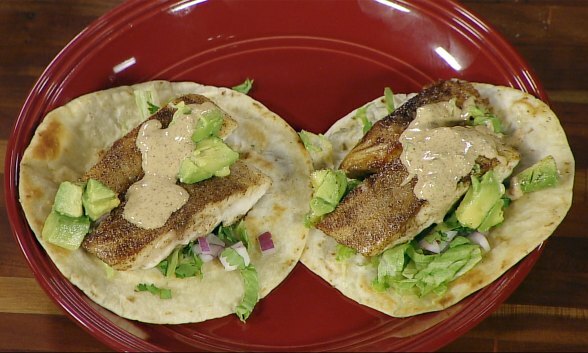 Cut fish into 1-inch strips and place on tortillas. Add lettuce, red onion, cilantro, and avocado. Top with Coastal Taco-lade Sauce (see recipe below). Mix water, vinegar, Creole seasoning, lemon juice, paprika, mustard, green onions, and mayonnaise. Stir until thoroughly mixed. Watch Chef Kevin Belton prepare Fish Tacos with Coastal Taco-lade Sauce in this video.